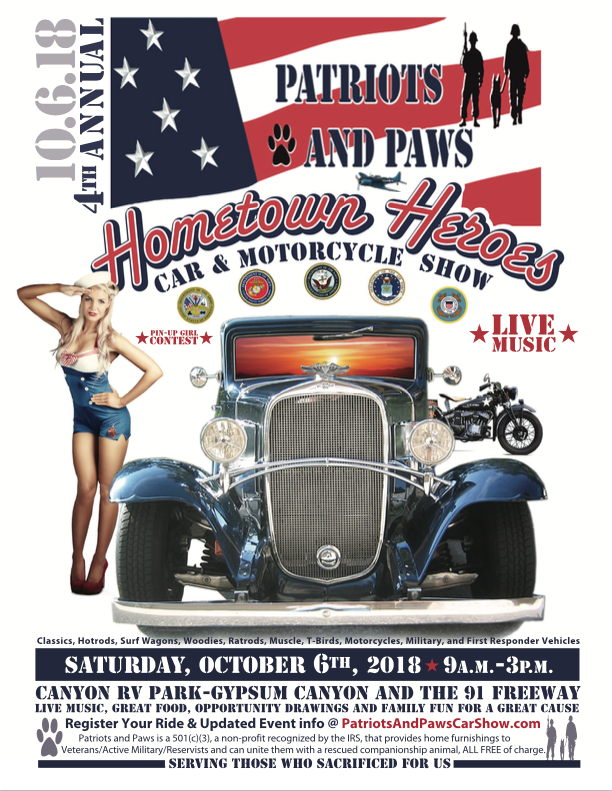 Our 4th Annual Show at the beautiful Canyon RV Park will have an Opening Ceremony with Color Guard & National Anthem, Live Music in the Amphitheater, Great Food by Heroes/Roscoes Deli, Military Rides in 5-ton Desert Storm Trucks, Classic 40’s-50’s-60’s Pin-up Girl Contest, 82nd Airborne WWII Living History Association, and a Flyover by a WWII Plane provided by Planes of Fame. Silent Auction, Opportunity Drawings, 50/50, & Family Fun. And, for a great cause, Patriots and Paws. First 200 vehicles registered online can be put into a drawing to Win a 2-Night Stay in a Cozy Cabin at Canyon RV Park, October 5th & 6th ONLY. Deadline to enter drawing is September 6th, 2018. •Roll in time 6:30-8:45 a.m.
•Open to Public 9 a.m.
What is Patriots and Paws? Patriots and Paws is a 100% volunteer non-profit that collects donated furnishings-TV’s, beds, tables, chairs, appliances, etc., from all over Southern California, brought to our warehouse, and Veterans, Active Duty, Reservists sign-up, and we will furnish their homes FREE OF CHARGE. We can also place companion pets with them, FREE OF CHARGE as well, and can help turn them into service dogs through our community resources. Hence, Patriots and Paws-Servicing those who sacrificed for us. Last year we helped over 1000 Veterans and their families.